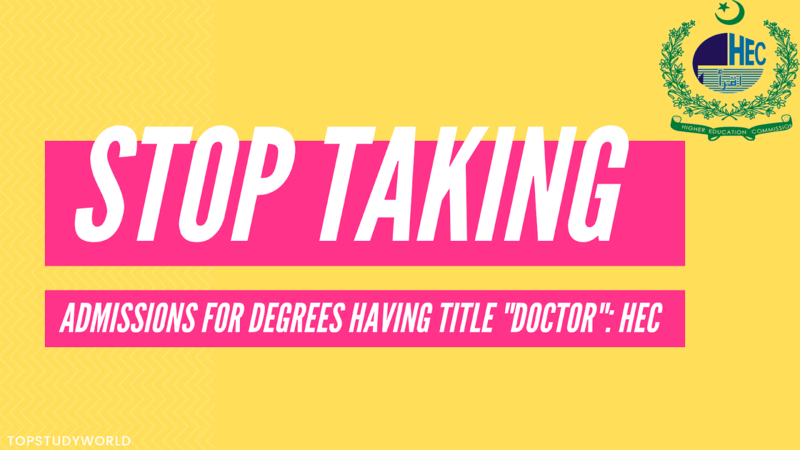 Students and parents are being misguided by institutions that are offering degrees in the name of 'doctors', and HEC has directed not to use the title of "Doctors" in their BS degrees nomenclature. They have to take approval from NCRS (National Curriculum Review Committees) constituted by HEC for using such a term in their nomenclature. These programmes fall under the category - being offered by different universities and colleges around Pakistan. "All the universities/ HEIs are hereby directed to stop further admissions in such programmes and withdraw their advertisements in newspapers as well as on their websites and social media platforms with immediate effect," the letter underlines. Furthermore, these degrees will not be recognized by HEC, and the students will face problems for a job, and the verified degree from HEC. The only degree that HEC allowed is "Doctor of Physical Therapy (DPT)" which is a five-year degree programme, and it can only be taught in those universities which have relevant faculty, infrastructure, required labs and attached hospitals for clinical practices. 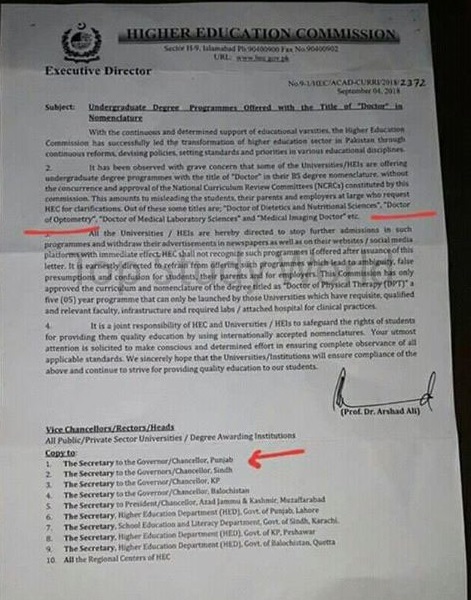 "It is earnestly directed to refrain from offering such programmes which lead to ambiguity, false presumptions and confusion for students, their parents and employers", the letter reads.